Former athletic director Patrick Nero announced his resignation in December after more than six years at the helm. When former athletic director Patrick Nero stepped down last month, colleagues said the announcement came unexpectedly. At the helm of the program for more than six years, Nero developed and implemented long-term directives to grow the athletic department. But just before winter break, Nero announced in a University release that he had informed Provost Forrest Maltzman of his resignation – effective just 13 days later – to allow for “fresh perspectives and ideas” in the athletic department as he pursues the “next phase” of his career. An athletic department spokesman said they have not yet launched a search for Nero’s permanent replacement because the University is still “evaluating the needs” of the department. Officials declined to provide a timeline for the search. During Nero’s tenure, 13 Colonials teams won championships, including back-to-back Atlantic 10 women’s basketball titles, the school’s first men’s basketball postseason banner with a 2016 NIT victory and three consecutive years with men’s tennis at the top of its conference. Nero – who extended his contract for six additional years in 2015 – has not publicly spoken about his next steps and declined to comment for this story. 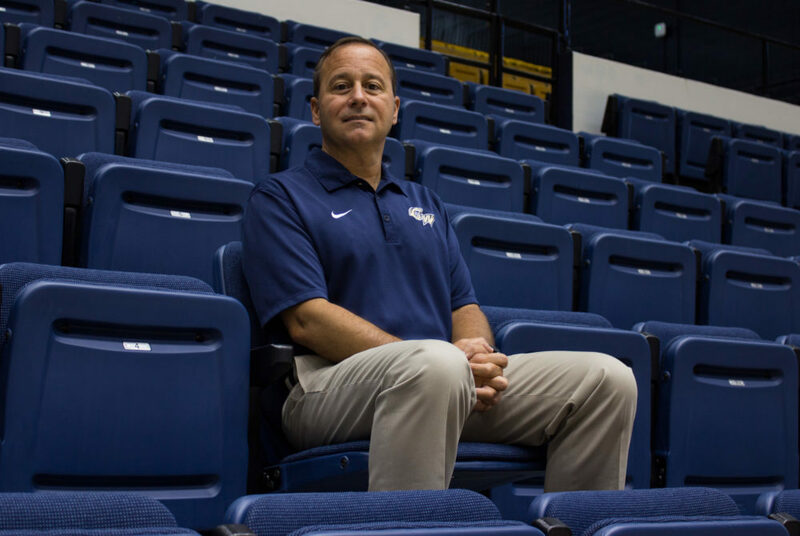 Less than a year into his time at GW, Nero signed off on the athletic strategic plan – a 22-page document outlining the direction of the department between 2012 and 2017. Nero helped implement the plan in those years, increasing the overall athletics budget, renovating GW’s baseball facilities and transitioning sailing into a varsity sport in the fall of 2012. The athletic department’s budget grew from about $20 million in fiscal year 2012 to more than $29 million in fiscal year 2016, according to data from the Department of Education. Following his departure, coaches said Nero’s open-door policy and desire to build relationships inside the department encouraged communication. But coaches said they didn’t anticipate his resignation last month. James Winchester, head coach for swimming and diving – a program that won its first-ever championship on the men’s side last year – said Nero was different from other athletic directors because of his interest in the team beyond their sport. Volleyball head coach Sarah Bernson – one of Nero’s most recent hires – said she had looked forward to working with him more because of his engagement in the process of building the team. Last spring, the National Association of Collegiate Directors of Athletics named Nero one of the athletic directors of the year. During the final 17 months of his career at GW, Nero faced criticism that led to multiple investigations in his department. About two years ago, The Washington Post reported a rift between him and the men’s basketball coach at the time – Mike Lonergan. Two months later, Lonergan was fired for failing to align with the University’s values and the two sides settled this fall after the former coach threatened a lawsuit. Kate Northrup, a lawyer for the EEOC, said Nero’s resignation will not alter the commission’s decision to continue prosecuting the claims. The University stood behind Nero and filed a motion to dismiss the case. Brian Sereno, an athletics department spokesman, said neither the commission’s lawsuit nor any other legal matters contributed to Nero’s decision to resign. The only other A-10 athletic director to step down this year – Don Dijulia of Saint Joseph’s – announced that he would leave his post with seven months notice. David Ridpath, a professor of sports business at Ohio University, said it is unusual for athletic directors to resign in the middle of an academic year unless an issue occurs. Nero was the fifth of eight high-ranking University officials to announce their resignation over the past five months. Ridpath said it is possible the recent arrival of University President Thomas LeBlanc influenced Nero’s decision to move on. Acting athletic director Tanya Vogel watches from the stands during a gymanstics meet Sunday. On the same day that Nero announced his resignation, Vogel was named as his replacement on an acting basis. 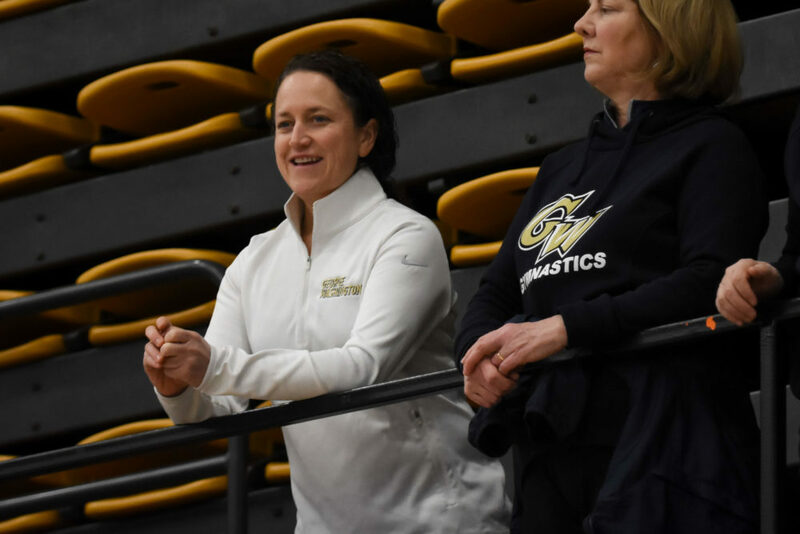 She has been a member of GW’s senior athletic staff since returning to GW in 2015. When Vogel joined GW Athletics’ administration in 2011, she became the only current employee to have played as a Colonial, coach a team and serve as an administrator at GW. Vogel said her career path is heading in the direction of becoming a permanent athletic director and saw this offer as an opportunity to prove her loyalty to the school. During her first two official weeks on the job, Vogel said there haven’t been any surprises because her colleagues are continuing with the same responsibilities they had before the transition. Vogel said she doesn’t plan to make any changes to how the athletic department operated under Nero’s leadership. Discussions about the plan for the next strategic changes began last month, but there is no timetable set for a new plan, she said. When Nero took over the role in 2011 from former athletic director Jack Kvancz – who served in the position for the previous 17 years – Vogel was a coach. She said by following the direction of the University’s new leadership, her staff can ensure a smoother transition.